The River Feshie is a tributary of the River Spey located in the western Cairngorm Mountains of the Scottish Highlands. The Feshie drains steep and rugged terrain, with the highest portions of the catchment found at over 1200 m elevation. The total catchment area is 240 km2. The river is unregulated by dams, and flows may rise and fall quickly, reflecting the steep nature of the watershed and its ability to quickly deliver water to the channel. 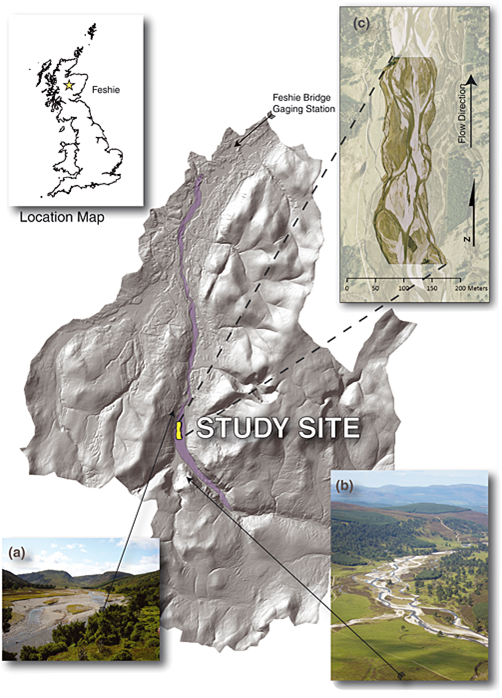 Our work takes place along a ~700 m reach of the river in Glen Feshie, a valley carved by glacial activity which ceased roughly 13,000 years ago. Since at least the mid-1800s, our study reach has maintained a multi-threaded, or braided, character. The image below describes our 2000-2013 study site in more detail. The braided/wandering portion of the Feshie has been delineated with light purple shading, and the 1 km long study reach (2000 -2013) is shown in a yellow box. (a) shows an oblique image of the reach looking upstream from the bottom of the reach, (b) shows a down-valley image from a ridge overlooking the reach, and (c) shows the boundaries of a 2005 survey overlain on aerial imagery. Figure from Wheaton et al. (2013).